Mission: To create a practical, powerful, natural skin care line that just makes sense to use and recommend. Makes Scents Natural Spa Line in Lancaster, PA was founded by spa industry veterans Heather and Nathan Kreider in 2010. Having worked at a world-renowned spa and other resort spas throughout their careers, the couple’s launch of Makes Scents was a natural professional fit for them. But the underlying drive and determination to launch the company came from a much more personal motivation – their personal quest to overcome some difficult circumstances and to turn life’s lemons into body products. 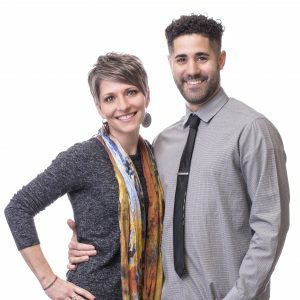 It all began when Heather and Nathan began creating luxurious bars of handmade, natural soap as a hobby and self-prescribed therapy to soothe their souls as they faced some personal hardships. To their delight, their business quickly grew into a much larger venture. Now they create many different lines of body products for premium spas and salons where others can enjoy them as they rejuvenate, relieve stress and escape their everyday worries and cares. Heather has worked as a Registered Nurse and esthetician in the spa industry for over twenty years. Her credentials include specialized European skincare training through the International Dermal Institute. With her education in skincare and experience in the spa industry, Heather channels her expertise and passion for exceptional products into producing high-quality skincare treatments using only the best quality, all-natural ingredients. For over fifteen years, Nathan has worked as a Certified Massage Therapist. He is skilled in various massage modalities including Swedish, Deep Tissue, Hot Stone, Lomi Lomi, Reflexology, and Reiki. In addition, he’s trained in numerous other body therapies including body scrubs and wraps. With a love for the spa industry and a drive to provide a superior skincare line that will enhance people’s spa experience, Nathan brings his enthusiasm, business acumen and pursuit of excellence to all he does at Makes Scents Natural Spa Line. Heather and Nathan are also backed by an incredibly talented and knowledgeable team of professionals who put quality first as they produce natural spa products that look beautiful, smell divine and feel exquisite. To create an effective and ethical natural skin care line, demonstrate environmental stewardship, maintain a supportive workplace, and give back to the community. Commit to consistently produce the highest quality natural and environmentally friendly products. Deliver superior customer service through a balanced blend of professionalism and fun. Cultivate a team-based work environment that enhances morale and sustains a welcoming atmosphere. Display dependability, honesty, and respect throughout all business relations. Maintain a spirit of motivation and inspiration. Dedicate ourselves not only to the success of our business but also to the happiness and well-being of our team members. Devote ourselves to giving back to our local and nationwide community, and we inspire others to do the same.